D'Egalité (by Don Juan de Hus x Stedinger) was named champion of the 2015 Westfalian Stallion Licensing, which was held in Munster-Handorf on 23 - 25 November 2015. The five members of the licensing committee were very positive about the high quality of the collection presented and were very liberal in handing out grading cards. No less than 44 stallions out of a collection of 80 received a positive verdict and a whopping 16 were named premium stallion. Ten of those were dressage bred. The gorgeous black D'Egalité is by Don Juan de Hus x Stedinger x Rohdiamant and bred and owned by Helmut and Regina Gieseker. He was named the champion of the licensing and sold at auction for 620,000 euro after a long bidding duel with Lodbergen to Rebecca Gutmann of Gestut Bonhomme in Werder, Germany. In the Westfalian society, horses registered with other breed societies can get selected for the premium ring. The reserve champion at this year's licensing was the Hanoverian branded Dimitrow (by Dimaggio x Brentano II x Weltmeyer) which sold for 430,000 euro to Austrian Sissy Max-Theurer. 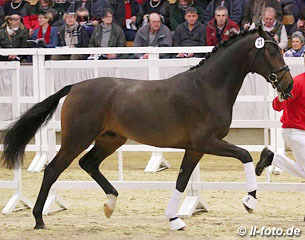 Dimitrow is bred by Friedrich and Edda Kröner and was owned by Mathieu Beckmann. The third ranked stallion was the Oldenburg bred Federico Fellini (by For Romance x De Niro x Andiamo), bred by Gerd Pigge and presented by Lodbergen. He sold for 250,000 euro and moves to Gert Jan Van Norel's stud in The Netherlands. Thirty-six licensed stallions were sold at auction and they achieved an average price of 99,972 euro. The non-licensed stallions achieved an average price of 17,722 euro.